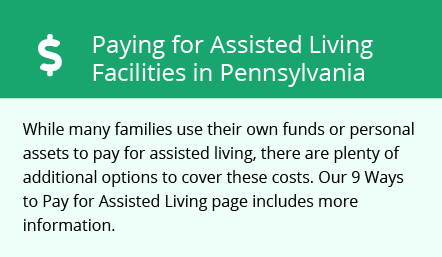 The average cost of memory care in Centre County is $5,785 per month. This is higher than the national median of $4,650. To help you with your search, browse the 5 reviews below for memory care facilities in Centre County. On average, consumers rate memory care in Centre County 4.8 out of 5 stars. Caring.com has helped thousands of families find high-quality senior care. To speak with one of our Family Advisors about memory care options and costs in Centre County, call (855) 863-8283. Centre County lies in Central Pennsylvania and this Penn State University town has a population of about 163,000 people, 13.7 percent of whom are aged 65 or older. Seniors in this age range are particularly susceptible to Alzheimer's and other forms of dementia, and 11 percent of seniors in Centre County on Medicaid have been diagnosed with the disease. There are two memory care facilities in Centre County to accommodate seniors with Alzheimer's disease, Huntington's disease and other dementias. In Centre County and throughout the Commonwealth, memory care units are known as Special Care Units and are typically located within Assisted Living Residences licensed by the Department of Aging, Office of Long Term Living. Compared to a state and national average of 100, Centre County has a cost of living of 102. Utilities, transportation and groceries are all under the national average in contrast to the higher housing cost of 120. The moderate cost of living may mean that families of seniors in memory care facilities have a bit more money to help pay for memory care. Violent crime in Centre County is 33.7, compared to the U.S. average of 31, while property crime here is 36.4, compared to the U.S. average of 38. These average crime stats combined with added security measures taken by memory care facilities should help ease the minds of family members concerned with their loved ones' safety. Centre County rated a 47 out of 100 on Sperling's comfort ranking. This is due, in part, to the 42 inches of rain and 43 inches of snow received annually, far above the national averages. With a year-round temperature range of 17 to 82 degrees, Centre County can be difficult for seniors with arthritis and other climate-sensitive conditions. According to the EPA's National Air Toxics Assessment, ranked on a scale of one to 100 (best), Centre County's air quality is 69, which is much lower than the national average of 58. Seniors with respiratory ailments might be able to breathe a little easier here than in areas with lower air quality. Memory Care costs in Centre County start around $5,785 per month on average, while the nationwide average cost of memory care is $4,798 per month. It’s important to note that memory care rates in Centre County and the surrounding suburbs can vary widely based on factors such as location, the level of care needed, apartment size and the types of amenities offered at each community. Learn more about these programs, plus who’s eligible, on our Memory Care in Pennsylvania page. For more information about different ways to finance memory care, visit our Memory Care in Pennsylvania page. Centre County and the surrounding area are home to numerous government agencies and non-profit organizations offering help for seniors searching for or currently residing in an assisted living community. These organizations can also provide assistance in a number of other eldercare services such as geriatric care management, elder law advice, estate planning, finding home care and health and wellness programs. To see a list of free memory care resources in Centre County, please visit our Assisted Living in Pennsylvania page. Centre County-area assisted living communities must adhere to the comprehensive set of state laws and regulations that all assisted living communities in Pennsylvania are required to follow. Visit our Memory Care in Pennsylvania page for more information about these laws.